As the movement for a local and ethical food system continues to gain traction, school food is slowly but surely becoming a focus in the fight for change. School districts serve lunch to 30.4 million students a day through the USDA’s National School Lunch Program (NSLP). The NSLP provides cash subsidies and USDA foods to enrolled schools, which in turn provide free and low-cost meals for qualifying students. 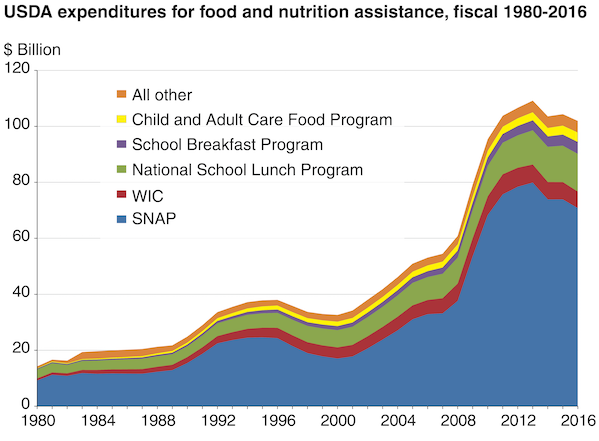 In total, meals served through the NSLP amount to as many as 5 billion per year. Due to the program’s scale and the influence of Big Ag interests, the lion’s share of food served through the NSLP has typically been sourced from large-scale producers, transported from afar and heavily processed. The resulting meals are often less than nutritious. In 2009, the ground beef the USDA bought from five major meatpackers and distributed through the program failed to meet the quality standards of most fast food restaurants. But two initiatives, the farm-to-school movement and the Good Food Purchasing Policy (GFPP), a nonprofit-backed policy initiative, are challenging this lunchroom reality, and working to transform the food chain status quo. The numbers look promising: the Chicago Public School Board voted to implement the GFPP in July, the first city district outside of California to do so, and 42 percent of school districts nationwide are participating in farm-to-school programming, according to the 2015 USDA Farm to School Census. Larger school districts have pulled off impressive food purchasing feats in recent years, suggesting that changes to the supply chain are already underway. But on the ground in Corn Belt states like Illinois, where only 6 percent of the food consumed by residents is produced locally, smaller school districts face obstacles to participating in this vision of a regionalized food system. Rural America In These Times spoke with several school food providers and experts about these obstacles, and about the local movement can chip away at corporate power in the food chain. Getting fresh produce into the cafeteria of the Williamsville-Sherman Community Unit Schools District (WCUSD) has been a challenge, says Pauline Osman, the district’s dietician. The district sits 20 miles northeast of Springfield, Ill., and began pushing for substantive changes in the cafeteria in the 2012–13 school year. Last year, Osman bought directly from a local farmer, but found that the cost was high and the logistics of transportation complicated. “We paid a premium for the farmer’s market produce, even though I worked with one farmer and picked up the tomatoes myself,” says Osman. Unfortunately, she says, many of the tomatoes spoiled quickly because wet ground delayed the harvest. For now, the district will look to the high school’s brand new greenhouse for tomatoes, and perhaps other vegetables. While the development of a horticultural program at WCUSD is exciting, the produce will likely contribute a negligible portion of the food the cafeteria serves over the course of the year. The district’s main food distributor, Central Illinois Produce, sources much of its produce from farms and vendors in California, and one vegetable farm in Wisconsin—regional, maybe, but not local. (Their “Illinois products” page, on the other hand, features yogurts, salad dressing, prepared soups, and El Milagro tortillas.) WCUSD has so far been unable to get Michigan-grown apples for a Farm-to-School initiative through its distributor, but hopes that they will be able to in coming years. Vendors and distributors have the greatest potential to shift purchasing practices, according to some local school food experts. “Vendors have the capacity to purchase in large enough quantities to really shift the supply chain,” says the National Farm-to-School Network’s Dombalis. Once vendors start making regional bulk purchases, she says, farmers, food hubs, processors and aggregators will catch on, too. 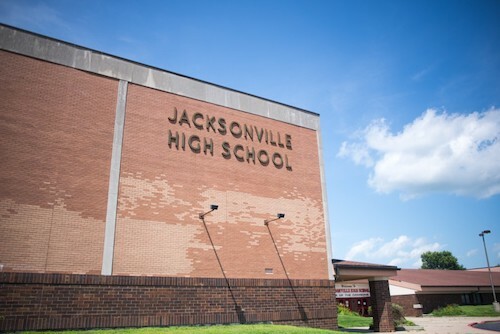 Thirty miles to the west of Springfield, the Jacksonville School District is purchasing 27 percent of its food “locally” through its distributors. In the 2014–15 school year they were able to select regionally produced foods through several different distributors, in addition to purchasing their bread and milk locally. Like WCUSD, however, Jacksonville has also encountered difficulties purchasing directly from local farmers. While Jacksonville was once able to purchase some produce through a farm stand, the district’s food service director Joyce Hiler says, the stand closed several years ago and they haven’t found an alternative. As distributors and school districts in central Illinois, like Jacksonville and WCUSD, find their footing in a shifting food chain, the National Farm-to-School Network is working to provide districts with support. Education is half the battle, says Lydia Van Slyke, the state lead for the Illinois Farm-to-School Network, particularly getting kids to realize that local produce simply tastes better. In 2015, the Illinois Network piloted a “Great Apple Crunch” program, which partners schools with apple-producing farms in the larger region. On a designated day in October, the schools have a special celebration, and the kids all crunch into an apple at the same time. “These are all kids who get apples presented to them all the time because they’re cheap and easy and usually mealy, and taste terrible and have been sitting in storage in Washington state for a year,” Van Slyke says. Other programs piloted by the Illinois Farm-to-School Network include the “Harvest of the Month,” which provides support for schools to partner with farms once a month to get a locally available fruit or vegetable onto kids’ plates. The students do “taste tests” of the produce and can visit the source farm to learn about the growing process. The relationships schools establish with farms for this monthly purchase, Van Slyke says, can hopefully serve as a stepping-stone to more regular purchasing from local vendors. But the National Farm-to-School Network is not the only food-oriented group looking to reach rural school districts. Since 2011, Monsanto has been sinking funds into rural school districts. Through an education fund called “America’s Farmers Grow Rural Education,” Monsanto lets local farmers nominate rural school districts to receive $10,000 or $25,000 grants toward advancing math and science curricula. By 2014, the fund was giving grants to as many as 15 rural Illinois districts. Monsanto’s funding reaches beyond school districts and into the heart of rural communities. Monsanto also offers agriculture scholarships and directs small grants toward community organizations, like 4-H groups or volunteer fire departments. While such funding is undoubtedly welcomed, Monsanto’s underlying intentions should be interrogated. Monsanto has an interest not in helping schools think innovatively about their place within the food system, but in preserving the status quo established in rural regions: intensive large-scale farms, corn and soy monoculture and reliance upon the herbicides and genetically modified seed they manufacture. In Illinois, upwards of three-quarters of all land under cultivation is planted with corn and soy. Although corn acreage has fallen by one million since 2011, soy acreage has risen by a staggering 1.1 million acres in the same window —93 percent of which is grown with genetically modified seed. Approximately three of Illinois’ 10 million acres of soybeans are RoundUp Ready 2 Xtend, a dicamba- and glyphosate-resistant soybean. Although illegal to apply to summertime soybean crops, the herbicide Dicamba is seeing heightened usage this year after Monsanto released its new soybean strain. Dicamba drift has damaged 2.5 million acres of soybeans across the Midwest this year—which will likely force many farmers to switch to the resistant strain in time for next growing season. Furthermore, 44 percent of Illinois grains are grown for export to other countries and most of the money in the agricultural industry does not remain in the community. According to data from Feeding America’s Map the Meal Gap project, the most food insecure counties are in the central and southern regions of the state, where corn and soy dominate the landscape. The same counties where school systems are having the most trouble procuring local foods. An influx of corporate money can influence the ways in which residents think about the food system and the role corporations play in maintaining that system. In northwestern Arkansas, near the corporate headquarters of Tyson and Walmart, food workers and residents have seen firsthand how difficult it can be to garner opposition to harmful corporate practices when the same corporations are supplying much-needed funding for schools and community organizations. 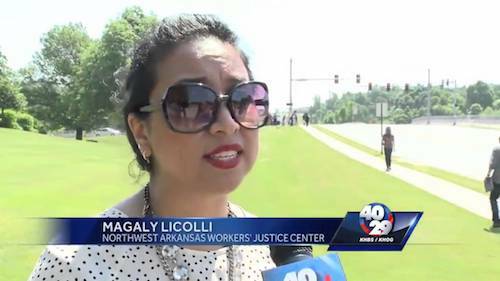 “Tyson and Walmart gave away so much money to the community, to nonprofits, to churches, to schools, to universities, to museums, to everything,” says Magaly Licolli, executive director of the Northwest Arkansas Workers Justice Coalition (NWAWJC), based in Springdale, Ark. Like Monsanto, Tyson Foods, the world’s second largest chicken processor, has a robust grant program. “So it was really hard for us to gain the allies here, locally, because people either respected the corporations or they are afraid to stand up to the corporations,” she says. 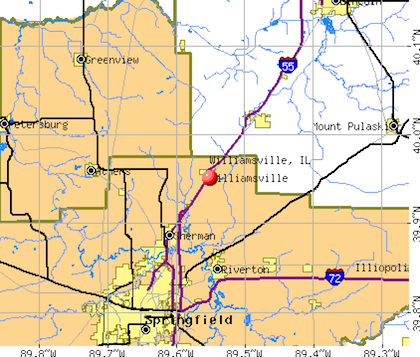 Licolli is leading efforts in Fayetteville, a town near Springdale, to implement the GFPP. The policy provides municipalities with the resources to evaluate the companies from which they source food according to five different criteria: animal welfare, environmental sustainability, nutrition, proximity to distribution site and fair labor practices. While the GFPP applies not just to a city’s school districts but also to major municipal institutions, it’s school districts that are often a city’s largest food purchaser. The NWAWJC first became interested in the GFPP after it helped to document horrific labor practices in Tyson-operated chicken processing plants. After seeing how different interest groups—animal welfare groups, workers rights groups and environmental sustainability groups—came together to secure a promise from Tyson to raise wages and security standards, Licolli thought the GFPP could help other cities gain leverage over large food corporations. The GFPP has proven itself a catalyst for change in the Los Angeles Unified School District (LAUSD), the first to implement the policy. Since its adoption in 2012, the school district has increased its local produce purchases (defined as within 200 miles) from 10 percent to between 50 and 72 percent. More recently, the district declined to renew a contract with Tyson because they did not meet the criteria for employee welfare. But the Golden State grows nearly half of the nation’s produce, and the LAUSD is the nation’s second-largest public school system—in other words, they already have purchasing power and a produce network in place. It remains to be seen how the policy could effect change for smaller districts in the Midwest and beyond, where budgets are pinched and fresh produce is not as readily available. As the NWAWJC gears up for its campaign, however, Licolli is optimistic that their work will begin to lay the foundation for a more equitable food system. “We really want to have people who represent all different values: farmers of color, food workers, environmentalists,” she says.